The Suffolk coast, eastern England, is north-south orientated and borders the southern North Sea. It is characterised by fairly small tides (spring tide range varies from 1.9 m in north Suffolk to 3.6 m in the south), a bimodal wave climate with waves predominately from the north-east and south, and sand-gravel beaches. In places, large accumulations of gravel form distinct beach-ridge forelands, such as the Orfordness shingle complex. There are a number of small estuaries and barrier-fronted lagoons (Figure 1). Figure 1. The Suffolk coast, including coastal type and coastal change. 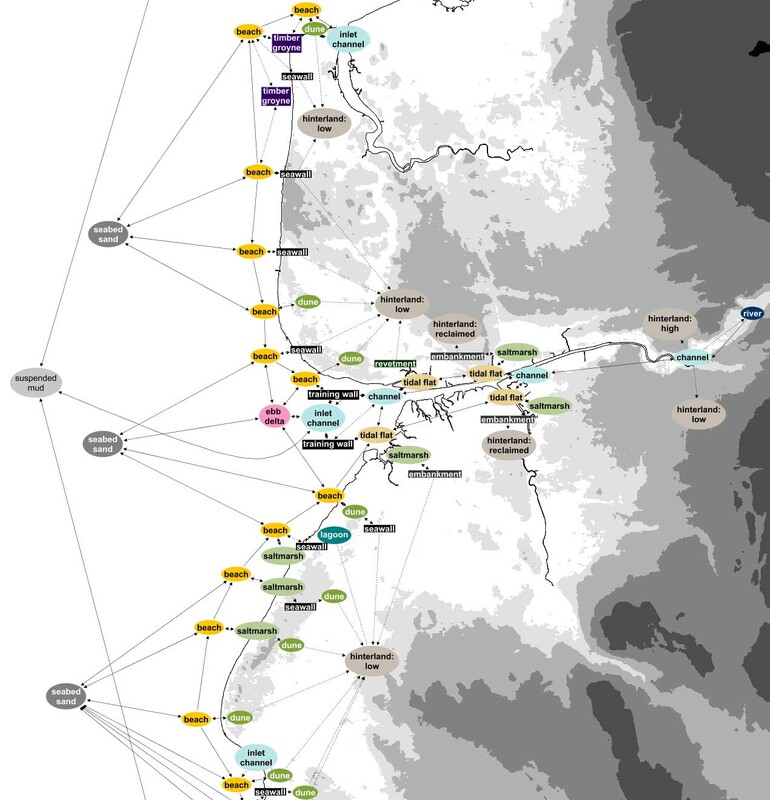 The suite of work conducted on the Suffolk coast as part of the iCOASST Project, included the development of a Coastal and Estuarine System Map of the entire Suffolk coast (available at: http://www.channelcoast.org/data_management/online_data_catalogue/), a model composition in southern Suffolk (outlined below) and a series of participatory workshops with stakeholders (e.g., French et al., 2016; Van Maanen et al., 2016). There are also analyses of coastal change (Burningham, 2015; Burningham and French; 2014; 2015; 2017; French and Burningham, 2015; Horrillo-Caraballo et al., 2015), and model development and application (Karunarathna et al., 2017; Thornhill et al., 2015; van Maanen et al., 2015; Walkden et al., 2015). Analyses of change in the relative position of shorelines, over decadal to centennial timescales (Burningham and French, 2017), supported much of the development of coastal landform behaviour models. 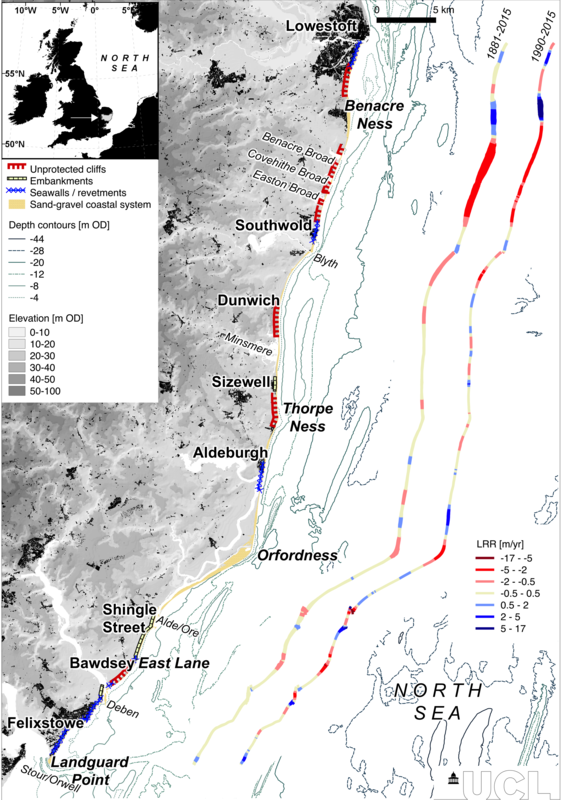 The application of SCAPE+ to the north Suffolk cliffs (Walkden et al., 2015) and coupling of SCAPE+ with MESO_i to the Bawdsey-Felixstowe coastline required information regarding shoreline trends sourced through the digitisation of mean high water (MHW) shorelines from OS maps and EA aerial photography and Lidar. These data have been analysed further, and a new hierarchical cluster analysis method developed (Burningham and French, 2017), to find common behaviours in coastal dynamics at different temporal scales. Unlike EOF and CCA analyses, cluster analysis captures the different modes of coastal behaviour that occur regionally, thereby providing a more objective basis on which to classify dynamics and then investigate the drivers of change. The Suffolk model composition focuses on the Deben estuary and inlet-adjacent shorelines (Figures 2 and 3). As found elsewhere in Suffolk, the estuary is characterised by a single low tide channel flanked by mud flats and saltmarsh, and the inlet is narrow, bound by small sand-gravel barriers and comprising ebb-delta deposits. The mean tidal prism of the estuary is approximately 17 x 106 m3 (Burningham and French, 2006). The neighbouring open coast shorelines comprise mixed sand-gravel beaches partially backed by soft cliffs in places. Both the estuary and the open coast in this part of Suffolk have been impacted by human interventions, including significant land reclamation and the construction of numerous sea defences, especially in the 19th and 20th century. The ebb-delta shoals at the mouth of the Deben show a broadly cyclic behaviour whereby the updrift shoal progressively extends until it breaches, after which the sediment is released to the downdrift coast. Further details on the composition are found on the model compositions pages. Figure 2. 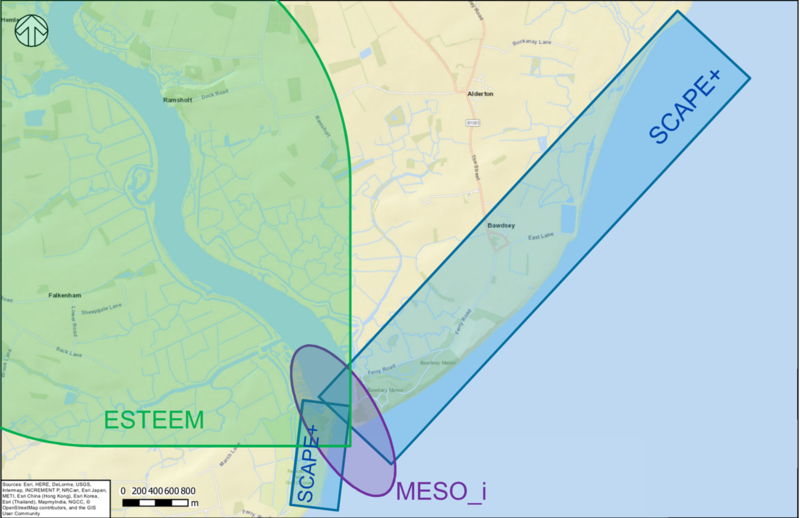 Initial composition for the Deben estuary and surrounding shorelines. Figure 3. The Deben estuary mouth. iCOASST held a series of stakeholder workshops in Suffolk during the course of the project, to understand the area and stakeholder perspectives, as well as present and discuss the results as they emerged. These workshops took place as follows: 22 March 2013 stakeholder workshop (Lowestoft); 26 June 2013 workshop with Suffolk Coastal Forum / EA Coastal Group (Woodbridge) (Figure 4); 29 June 2015 CESM/CSI workshop (Woodbridge); 13 July 2015 Modelling workshop (Lowestoft); and 19 May 2016 (Ipswich). We also engaged with the Suffolk Coastal Forum. Figure 4. 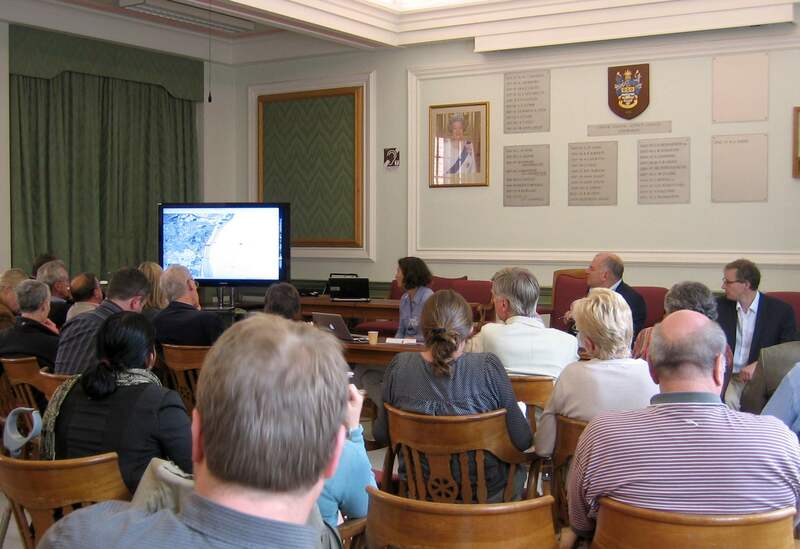 Stakeholder meeting with the Suffolk Coastal Forum at Woodbridge, 26 June 2013. Burningham, H. (2015) Gravel spit-inlet dynamics: Orford Spit, UK. In: Randazzo, G., Cooper, J.A.G., Jackson D., Sand and Gravel Spits, Coastal Research Library. ISBN: 978-3-319-13715-5, pp. 51-65. Burningham, H., French, J.R. (2006). Morphodynamic behaviour of a mixed sand-gravel ebb-tidal delta: Deben estuary, Suffolk, UK. Marine Geology 225, 23-44. French J.R., Burningham H., Thornhill G., Nicholls R.J. (2016) Integrating estuarine, coastal and inner shelf sediment systems in a common conceptual framework as a basis for participatory shoreline management. Geomorphology and Society, Springer, pp. 245-277. Karunarathna, H., Horrillo-Caraballo, J., Burningham, H., Pan,S. Reeve, D.E. (2016) Two-dimensional reduced-physics model to describe historic morphodynamic behaviour of an estuary inlet. Marine Geology, 382, 200-209. 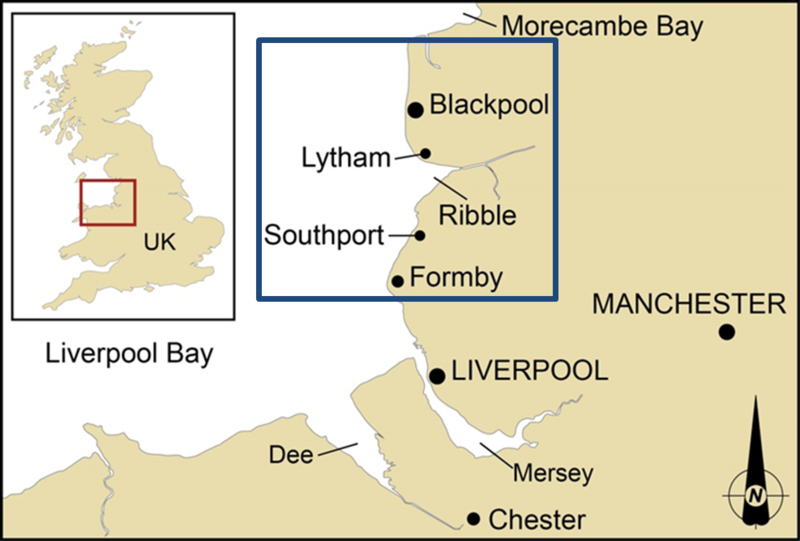 A number of studies were conducted on the Liverpool Bay coast as part of the iCOASST Project, including the development of a Coastal and Estuarine System Map of the entire Liverpool Bay coast from Llandudno to Fleetwood (available at: http://www.channelcoast.org/data_management/online_data_catalogue/), a model composition from Formby Point to Blackpool (outlined below) and a series of stakeholder workshops where the results were discussed (e.g., French et al., 2016; Sutherland et al., 2015a; 2015b). As a whole, Liverpool Bay is a prototypical hypertidal shelf sea, where the regional dynamics are strongly influenced by the adjacent estuaries (Brown et al., 2016). Tidal currents are strong, but it is the weak residual circulation that controls the net sediment transport within the estuaries and along the adjacent coasts. The sediment within the bay is mainly medium to fine sand (Brown et al., 2015). The study site used for the model composition between Formby Point and Blackpool is low-lying with significant areas at coastal flood risk. It includes the large Ribble estuary. Around Formby Point, the coast is a wide, sandy foreshore, backed by the largest coastal dunes in England. Most of the coastline is undefended, and the seawall at Southport backs an accreting beach where saltmarsh is starting to develop. The Ribble is naturally accreting and has a long history of reclamation, providing extensive areas which are now potential managed realignment sites for reducing flood risk and re-creation of intertidal habitats. Extensive sandy tidal flats within the mouth of the Ribble link to wide, sandy beaches to the north, on the Fylde coast. The only section of soft cliff within the study area is at Blackpool. This cliff has been protected by a seawall for many decades and longer and holds the shoreline seawards of its natural position. iCOASST held three stakeholder workshops during the course of the project, to understand the site and stakeholder perspectives and concerns, and present and discuss the results as they emerged. These took place as follows: 4 July 2013 (at Crosby Lakeside Adventure Centre); 22 April 2015 (at Crosby Lakeside Adventure Centre); and 6 April 2016 (at Foresight Centre, Liverpool). Figure 3 shows a field trip on 3 July 2013 where the iCOASST team visited the coast from Liverpool to Southport led by Graham Lymbery and Paul Weiss (Sefton Council). Figure 1. Liverpool Bay and the study area within the blue box. Figure 2. The Coastal and Estuarine System Map for the Formby to Blackpool study area. Brown, J.M., Amoudry, L., Souza, A., Rees, J. (2015). Fate and pathways of dredged estuarine sediment spoil in response to variable sediment size and baroclinic coastal circulation. Journal of Environmental Management 149, 209-221. Brown, J.M., Norman, D.L., Amoudry, L.O., Souza, A.J. (2016). Impact of operational model nesting approaches and inherent errors for coastal simulations [in special issue: Coastal ocean modelling] Ocean Modelling, 107. 48-63.